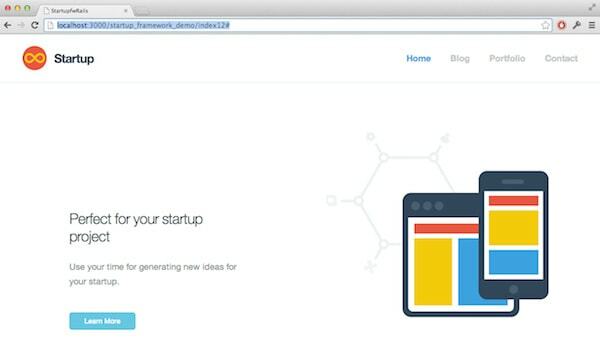 Startup Framework is simply great to start building web sites and applications. Ruby on Rails is a great platform and framework on which a lot of web applications are built these days. Together, they can fit well and make really quick applications with a great UI/UX in a very short turnaround time. I felt the need to bring them together. Thus I built a ruby gem called [designmodo-startup_framework-rails]. In this article, I will demonstrate how to get your application up and running using the Startup Framework Samples on Rails in under 5 minutes. To get started, you need to create a new rails application unless you already have one. In case you already have one, then you can jump to the “Editing the Gemfile section,” otherwise execute this at command prompt. This will, as we all know, create a folder with the name `startupfw-rails` and create a skeleton with a basic empty rails application. We will modify the gemfile to make our application ready for Startup Framework. You need to add a few entries to your Gemfile. They are as follows: As a part of the pre-requisites of the gem, we need to have jquery-ui, less-rails, less-rails-bootstrap and twitter-bootstrap-rails. We will be adding these gems to our gemfile. I have left out any version dependencies, so you can actually use any version you like. The only dependency from Startup Framework perspective is that you need to use Bootstrap v3.0 as a minimum. Here goes an excerpt from the Gemfile. You may add this at any point in your Gemfile. I usually work with a lot of clients and they all have their own licenses of the Startup Framework. Thus I have been a little paranoid about this installation. I make sure that the entire installation can be done in such manner that the Startup Framework sources or artifacts never actually leave your system. Neither they will be copied to your SCM system nor should they be provisioned to your staging or production server. I am writing an article on local asset compilation for rails which complements this gem in such manner that licensed products like Startup Framework or Flat UI Pro doesn’t need to be copied over to the the production server. There are two main options that you may consider while installing the Startup Framework. First, you might not already be using a reasonably famous gem called [designmodo-flatuipro-rails](https://github.com/reflection/designmodo-flatuipro-rails). In case you are and you want to retain that, I have built an option to do exactly that. Otherwise you may just execute this at your home directory or rails root of your application. The location `/Users/roney/downloads/StartupFramework` is the location where I downloaded and exploded my copy of Startup Framework. If you are already aware of the contents of Startup Framework, you might already double check that the location that you point to should contain two folders, Developer and Designer along with a Readme.txt. The installer will give an error if you point to any other directory. 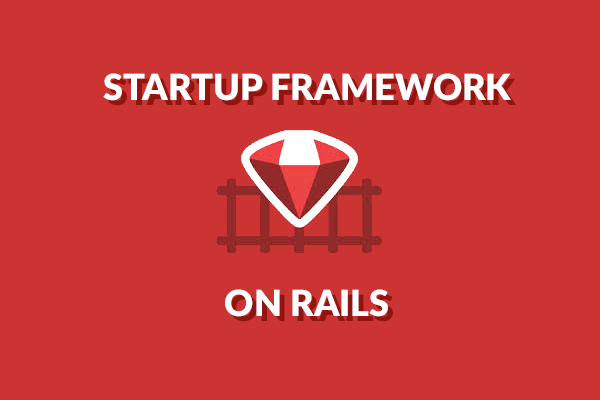 Your rails application is now ready to use and fully integrated with Startup Framework. That’s how easy it is. How of course you may ask, how do I start using it? Well, that’s what the next section is all about. We will generate rails files for you for the specified samples of Startup Framework. Its called the Demo Generation. Once the installation is successful, you may come over to this part. This part, although optional gets you kick-started into getting to see the samples of the Startup Framework as a part of your rails framework. Lets say you want to generate a rails view for the sample-12. And then navigate to `http://localhost:3000/startup_framework_demo/index12`. Remember to replace the number 12 with the sample number that you chose to generate. It should look like this on your browser. You can do this for all the samples. In case you want to create your own view, you need to follow the guide on Github [designmodo-startup_framework-rails]. In case you have any issues regarding this implementation, tweet me @roneyban. Happy Rails! Roney is a rails enthusiast and a enterprise mobile application architect. He helps startup companies build their vision and product. He has been the founder of Quarterback and Vertmac Technologies. This made my life so much easier. Thank you so much. Hi Roney, I followed your guideline and I’m getting an error. I don’t know why. Please help. But after fixing the issue, the style of the demo site still didn’t look right…hopefully you have better luck. Hello it seems interesting. I saw you mention about licenses? do we need to buy something here or what? is this free? … ^. Bundler cannot continue. Any idea on what I’m missing? I literally copied the gem file from the website.